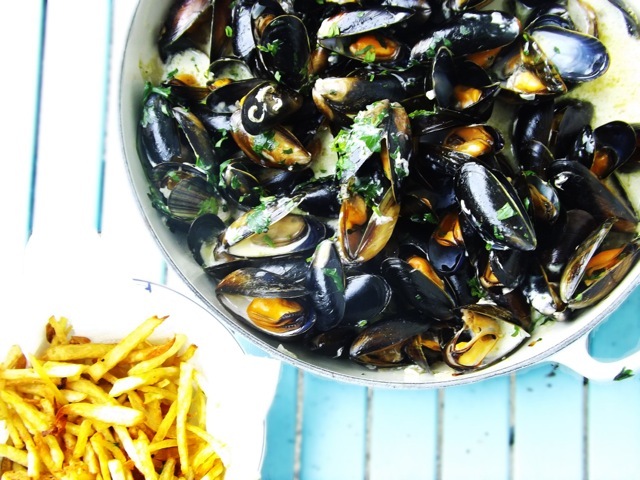 Having been writing seafood recipes for the past few days, last night I had a spare bag of mussels. I also had some potatoes, cream, garlic, white wine, parsley and shallots – so supper was an obvious choice. I’ve always loved Moules Marinières, ever since being taught as a boy to use an empty shell as a mussel-removing tool. A few years later, my great Aunty Suzy in Paris told me that this was a Belgian dish, and taught me that the only way to have it was with beer. The fries with this are a must, and this method is much quicker than the blanching and cooling method traditionally used. The difference is almost unnoticeable. Clean the mussels well, removing their ‘beards’ and soak them in cold water for 15 minutes. Discard any that are broken, won’t close when tapped or remain open after soaking. Rinse the fries in cold water for five to 10 minutes, then drain and pat dry with kitchen towel. Pour the groundnut oil into a deep pan, ensuring it comes no more than halfway up the inside. Add the fries and turn on the heat to high. Do not leave the pan unattended. Cook until starting to turn golden brown, then remove them and put in a bowl with kitchen towel to drain a little. Season well. Meanwhile, heat some olive oil in a large, heavy-based pan and gently sauté the garlic and shallots. Season well and add the mussels. Turn the heat up and pour in the wine. Cover tightly with a lid and steam for six to 10 minutes. Throw away any that haven’t opened. Finally, add the cream and parsley, and serve straight from the pan with the fries.